A Four-Star hotel offers deluxe accommodations in an upscale environment. Guests can expect attentive service and expanded amenities. 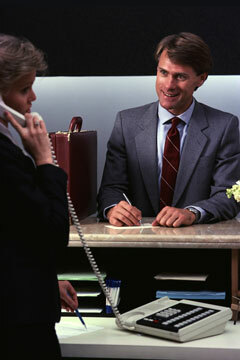 Valet parking and bellhop service as well as concierge and automatic turndown service are often featured. Amenities commonly include swimming pools and fitness centers. A four-star hotel typically features one or more restaurants with room service available during extended hours. The reception area of a four-star hotel is refined and smartly appointed, and guest rooms feature stylish furnishings and linens. Most four-star hotels are located in commercial or resort areas near shopping, dining, and other major attractions. Their physical presence reflects an enhanced level of quality throughout, and their fundamental hallmarks are an extensive array of amenities along with above average hospitality, service, and attention to detail. On this page, you will find a list of hotel chains whose properties are often considered "four-star" caliber. Note that selected hotels in these chains may also be worthy of a five-star rating. You will also find links to the AAA's list of four-diamond lodgings. Hyatt Hotels and Resorts feature over 200 properties in over 40 countries around the world. Grand Hyatt Hotels serve large business destinations that attract leisure and corporate travelers, as well as large-scale meetings and conventions. These business hotels, reflecting grand scale and refinement, include state-of-the-art technology, sophisticated business and leisure facilities, world-class banquet and conference facilities, and specialized programs that cater to discriminating business travel and vacation guests. Park Hyatt Hotels distinguishes itself as a small world-class, residential-style hotel with international flair. It is custom-designed for the discriminating traveller who seeks privacy, personalized service and outstanding quality during their stay. Leading luxury hotel company features a distinctive collection of North American and Caribbean properties. Fairmont Hotels & Resorts is known for warm and personal service at their elegant hotels and resorts. Texas-based firm features a series of upscale hotels and resorts throughout the United States, Canada and Mexico. Omni Hotels offer free wi-fi and high-speed Internet access, as well as in-room treadmills, on-site business and fitness centers, speaker phones with dual lines and voicemail, data ports, complimentary guest robes, and gourmet dining. Westin Hotels & Resorts redefine efficient service with an effortless style and gracious attitude that ensures a truly unforgettable experience. Welcoming, yet not overwhelming, Westin properties are architecturally inspiring, thoughtfully designed and located in exciting cities and sumptuous resort destinations. Swissotel Hotels & Resorts is a distinctive group of deluxe hotels for today's discerning business and leisure traveller. It combines modern and functional design with local character and Swiss hospitality, service efficiency and product quality. Located in gateway destinations and city centers, the hotels offer convenient access to business and shopping districts and local attractions.